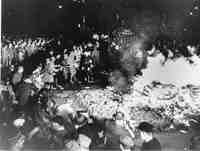 Eighty years ago today saw the first great book burning in Nazi Germany. On 10 May 1933 university students across the newly proclaimed Third Reich listed books they deemed "un-German". They then collected the books they had remove from raided libraries across the country, took the offending books and burned them in great ritual bon-fires in public squares and on street corners. The works of Karl Marx, Sigmund Freud, Erich Maria Remarque - of All Quite on the Western Front fame - and Kurt Tucholsky were amongst the writing that went up in smoke. The burning continued over the following week. The whole sorry event was organised by Germany's national student union. A similar event held in 1817 prompted Heinrich Heine's warning "Where books are burned, in the end people will be burned too." How terribly prophetic his words were to become! In a much less dramatic way we are today witnessing similar developments. The factionalisation of the news media combined with the internet's ability to tailor the world we experience to our existing political preferences means that an increasing number of people lead a blinkered mental life of the type that led Nazi students to torch the books of people with whom they did not see eye-to-eye.